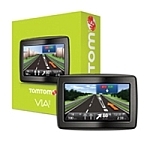 Dutch navigation service provider TomTom has entered the Indian market by introducing the VIA series of their personal navigation devices in the country. The devices will be available for purchase from next month. The prices of the device will start from Rs 15,000 and consumers can get their hands on them at retail chains and independent car accessories stores as well as on-line (like Reliance Autozone, Reliance Digital and Flipkart.com among others). "There is no doubt that the navigation market in India is growing briskly and looking for high quality, easy to use navigation solutions. With the extensive experience that TomTom is bringing to the region coupled with its global quality standards and processes we can change the current regional landscape" said Jocelyn Vigreux, Managing Director, TomTom India. The company had set up its sales office in Pune earlier this year. According to the company, TomTom's automotive-grade quality maps of India (that cover the entire country with street level details) will form the backbone of the VIA range targeted at the Indian car driver. The company will continue to expand coverage and add relevant content like points of interest for landmark navigation for the growing Indian market. While Via 125 comes with a 5 inch display screen, the other two models come with 4.3 inch screens. Also, Via 125 and 120 have 4GB of internal flash memory and Via 100 has 2GB of internal flash memory. Key features of the devices include Landmark navigation which helps users in finding their destinations. TomTom maps feature all the monuments, chowks, parks or attractions so users can search for the nearest landmark and let TomTom show them the route. Hands-free calling and advanced lane guidance has also been provided in the devices. Additionally, although all three Via models feature turn-by-turn voice navigation, Via 120 and Via 125 also come with Voice Control functionality. A new feature called 'Help Me' has also been added by the company for its Indian users that lets the users store emergency numbers. TomTom will be facing a competition from navigation service providers like MapMyIndia that launched CarPad, a new GPS device, in partnership with Qualcomm Incorporated. The device runs on Qualcomm's Snapdragon S1 processor, has MapmyIndia's latest GPS navigation interface and is priced at Rs 22,990.